Do these two song titles seem to conflict? Guys, cover your ears. An older girlfriend once told me that having babies is “just like a bowel movement.” As a young adult, I didn’t exactly believe her, but I hoped it wouldn’t be too bad. A nurse I knew described how each of her five children was born twice as fast as the last. Her first labor was a few hours, but the next was only two. With the last one, she had only a few minutes warning. 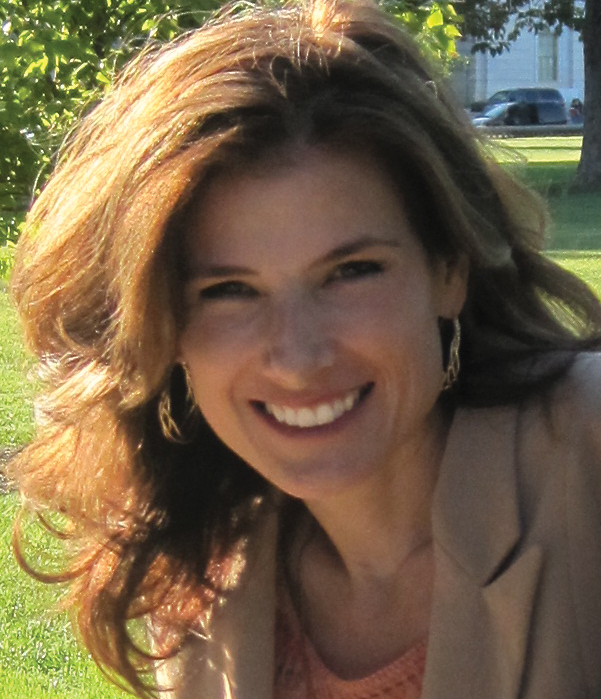 I read books during my first pregnancy; I went to classes and did everything I could to learn to have a baby as painlessly and quickly as possible. Finally, I went into labor on a Tuesday. And we did not see my daughter until Thursday morning. My midwife wrote in my medical file that the active part of labor (closely timed, hard contractions) was 29.5 hours. It was nothing like what I thought – and it didn’t really hurt, except that I thought I would die from the pain. My daughter turned breech, aligned her spine with mine, and eventually turned again. Finally, the cervix dilated 4 centimeters in one contraction. Pain doesn’t kill you. Thank God. I became more stoic about pain, because telling others loudly doesn’t make it much better. No one knows many experiences until they live through them. But even then no one can know exactly. There are things in life nobody can know, except the one facing them. Each of my five labors has a unique story. Even I didn’t know what to expect. The 2nd baby was born in six hours. I never called the midwife to come because I wanted to avoid the awful experience of a crowd standing around watching me struggle and suffer. She did come in the nick of time, because she felt a need to check on me, and let herself in the front door. 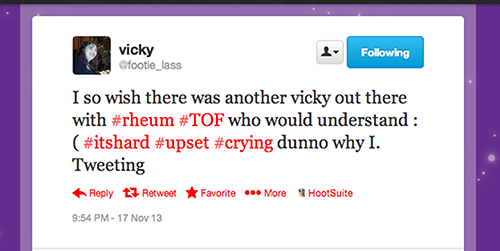 I saw this tweet by Vicky tonight. She says, “dunno why I Tweeting.” I do. The same reason she says, “I so wish there was another Vicky out there” – She knows nobody knows. And, somewhere inside she hopes in a world where someone will reach out, and try to understand. A close friend’s dear husband once saw my knees swollen, and remarked how they must hurt. “Hmm,” I thought, “so this is what it’s like to have sympathy.” Pain and swelling don’t always go together, and I don’t often have very conspicuous swelling. The first couple of years that the Baker’s cysts were swollen, they didn’t hurt. There was just the occasional icepick pain on the front of my knees. Now, the Baker’s cysts ache deeply. They look the same as they did. You’d have to ask me, or you wouldn’t know. Fortunately, like the midwife who “felt impressed to let herself in” because she said God led her, I’ve met many “friends shaking hands, sayin’, ‘How do you do?’” The next line is “They’re really sayin’, ‘I love you.’” Like my friend’s husband, who can’t walk in my shoes, but is willing to try. It is a wonderful world. 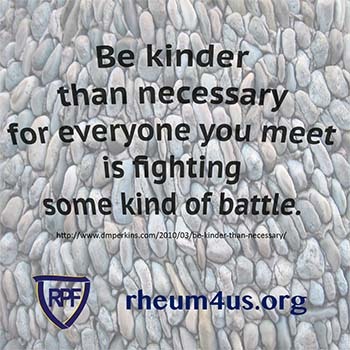 It would not be wonderful for everyone to truly understand Rheumatoid Disease because they’d have to experience it. Instead it’s a world where we can offer compassion even when we don’t know. I pray that we will be kinder than we think people deserve because we realize that nobody knows what troubles others have, and that caring makes it a more wonderful world. ← Could Ultrasound Prevent Rheumatology Patients from Receiving Disease Treatments? Sympathy and illness recognition is such a difficult topic. It’s complex as we know. To be honest though I am a kindred sufferer, I even catch myself silently judging others at times and am shocked that I do so. The operative here is “silently” though. Hasn’t anyone ever pulled into a handicapped spot that maybe you would have like to use, they get out of their car and “look” healthy to you? I admit that I’ve silently wondered about them. I’m ashamed that the thought crosses my mind but it does. The give and take of sympathy is so complex. I’m glad we explore the subject but we are after all only human and can only try. What I was hoping to say in the post is that while no one can truly understand, that can be okay – – There are many wonderful people in the world who are willing to try, or express whatever level of compassion they can. It would help us to focus on that. As usual, you are able to beautifully articulate something I’ve thought about but in my head it is all a jumble! You’ve also reminded me to be a bit kinder to those I get fed up with because they don’t understand what it is like. And finally – that song! What a Wonderful World has been “our song” though after 20 years of marriage we often forget. While I can’t dance around the living room like the old days, I think my DH and I will manage to stumble around to our song today! I learned a valuable lesson when my children were little. At that time I hadn’t been officially diagnosed with RA but I was already battling Inflammatory Bowel Disease and coping with the loss of my mother and the loss of my second pregnancy. I met a woman who always showed kindness but never complained. We became friends and one day I told her of my troubles. I was astounded to discover that even though she was a healthy looking,outgoing, kind, and compassionate person that she had been dealt a far more unkind hand in life. She had lupus and had struggled through organ damage and surgery and she had lost a four year old child in a car accident and she very nearly died from that same accident. I was humbled. We all have a battle to fight. It is just that some are more visible than others. As a nurse, I have learned that there is always going to be someone out there much worse off than I am. It gives me an appreciation for the good that is in my life. Just like nobody knows what I’m going through, the same can be said for the people I encounter. Another great lesson I’ve learned is being kind to others is a win-win. It lifts the other person and it even helps you to feel better. We spend so much time sharing ideas on how to feel better…how to reduce our pain, what meds to take or what diet and exercises we can be doing. It’s wonderful to have a network to share these things, but even though we may have similar problems, we don’t all have similar remedies. The only thing I think we can all benefit from is being kind to others. There are a few days here and there where even my tank is empty. We all have times when we just can’t reach in and pull anything out, but my wish is I can live the remainder of my life in gratitude and share that to the best of my ability with others.